The Shaun The Sheep Movie has opened in time for half term (guess what we will be doing at the weekend?) and to mark the occasion, Rowan Yarns and The Sunday Telegraph gave away 2 balls of yarn to every reader at the weekend (if you're in the UK and missed this, it's the kind of thing I post on my Facebook page, be sure to follow and subscribe to notifications). In addition to free yarn, the pattern was published on the Rowan website as a free download. It uses just 25g each of Rowan Pure Wool DK in snow (012) and black (004) and 3.25mm needles. It would be pretty easy to substitute from stash, I'm sure. The pattern is straight forward and relatively quick - which is good as I have to make two of them. In response to cries of "whose are you making first?" I'm knitting two-at-a-time. 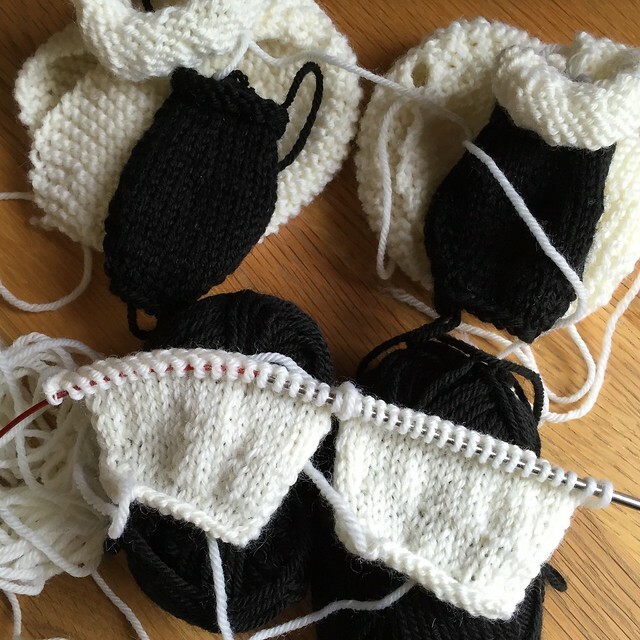 Once these tails are finished, I have only eight legs, four ears and four eyes to go. Overall this was a great freebie! I recently noticed lots of my friends had 'liked' The Art of Knitting page on Facebook. As I don't go to supermarkets or newsagents very often it had completely passed me by, so when the publisher contacted me, I said I'd be interested to take a look at the first couple of issues (disclaimer: a freebie - which hasn't influenced my opinion) to see what everyone was 'liking'. Since failing to complete the entire 'Joy of Knowledge' encyclopaedia set as a child (and realising how much pocket money I'd spent on my semi-and-therefore-useless collection) I haven't bought any part-works out of principle, yet it's clear they remain popular. Looking at the first couple of issues of The Art of Knitting, it's easy to imagine why people start collecting them. 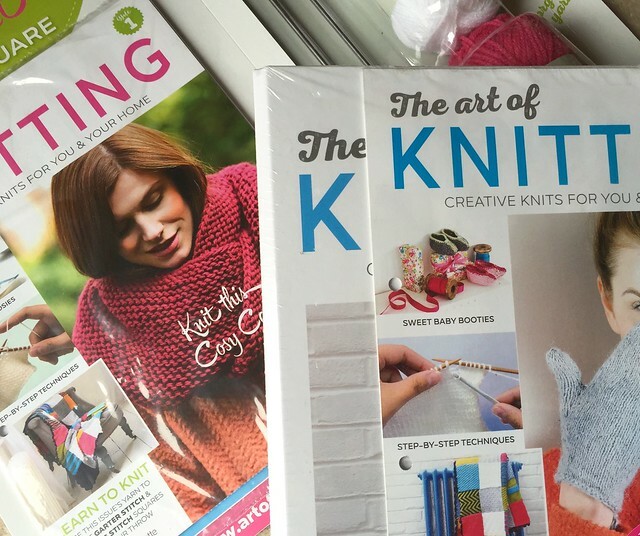 The first issue includes free knitting needles and yarn (more on those in a moment) and the second includes more yarn and a huge free binder - empty, until you purchase more issues to fill it up. The aim is for you to subscribe so that week-by-week your pattern and stitch library will grow, you'll learn new techniques and make a patchwork blanket. The next few subscriber issues include lots more freebies - knitting goodies including a bag, bamboo needles, notions and more yarns. The yarns will eventually be enough to make that lap-blanket, as you practice your knitting. So onto the free gifts. 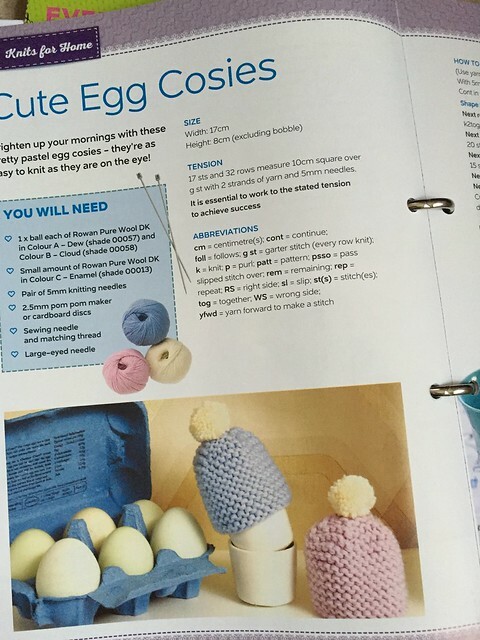 Sadly, if this is intended as a 'learn to knit' publication, this is where it falls down for me. Long poor-quality metal knitting needles and splitty squeeky acrylic yarn - urgh. I can hear the cries of "What do you expect? They are free!" Yes, but the average beginner won't want to buy more until they get enjoyment and success from their early attempts and as I've said before (under "get (a bit of) the right kit"), I really don't think that using these tools will get a very good result. Using poor tools makes learning a new craft a lot harder than it needs to be. Personally, I consider this a 'freebie fail', although I know my standards on this are high. Printed knitting patterns are typically written sparingly, and use minimal space. Not so in TAoK, which includes large fonts and generous page layouts with plenty of margin space (see left - an entire page for materials and abbreviations). As I attempt to use less paper and to declutter my home, this is another thumbs down from me - although I also prefer digital knitting patterns and learned to knit from YouTube, so I'm really not the ideal demographic. There are some nice basic projects in the first two issues. They are the kind of thing you can find via Pinterest and knitting blogs, even if you're don't know about Ravelry. I would expect them to become more advanced and interesting as the series progresses. The projects are nicely photographed and wouldn't look out of place in the early issues of Mollie Makes. The technique instructions are also backed up by online videos on the YouTube channel and Facebook. I don't know the total cost of the series. The regular price is £2.99 per week, plus if you subscribe there are additional automatic charges for binders and dividers to store them all in. If you like collecting this kind of part-work, then I guess it's up to you to decide whether that represents good value for what you're looking for. For everyone else, it might be one to look out for and pick up as and when there's a project that you particularly like. Before I go, I have to say a massive THANK YOU for all the lovely comments on the release of my Sky Full of Stars pattern at the weekend. I think I've replied to everyone who emailed and left kind words, but just wanted to say that your encouragement is very much appreciated. I'll be back later in the week with a giveaway of my own, and will show you what my crochet hook has been busy with! We took my 2 1/2 yr old to see Shaun the sheep movie on Sunday and it was great! It was my sons first time at the cinema and he was so good! Think I might make one of these sheep as a treat for him!